End of the Season. Not End of the World. A quick, oh so quick summary of the Phuket weather since the last update on April 5th (last Thursday). Friday - hot with some rain in the night. Saturday 7th was HOT and I spent lots of money. New camera, Canon EOS 60D to replace my 20D. And I've hardly had time to use it this whole week! But it's lovely. Then spent time in the garden and painting the wall around our garden, and by 6pm I was parched. Headed to a friend's restaurant - The Lunch Room - for dinner, a few beers and English football on TV. We had a BIG thunder storm roll through with very loud thunder and lashings of rain. My home rain gauge said about 1 inch fell in 30 minutes. After that, no rain until last night, a short, hard thundershower again. The whole week has been hot, though a light wind did blow on Tuesday so it felt slightly cooler. For anyone working in the tourism business, April is an odd month. We locals all know the weather will be hot with some thunder now and then. Normally great weather, but most travel agents overseas only sell Phuket up to the end of March. So we're suddenly quiet in April despite the super weather. The diving is good, the seas are calm, great for any on-water activities, days are hot and sunny. Come to Phuket in April! And many hotels have cheaper prices too. Yes, it's the end of the season and there is a slight risk of bad weather, but that is rare. Photo break... a budgie flew into the window of our dive shop a couple of days ago, then fluttered around the restaurant next door. Where did it come from? No idea. 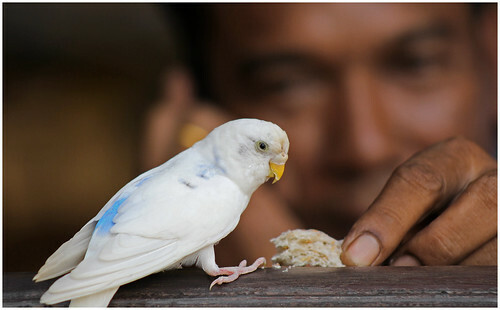 A local taxi driver befriended it and fed it some bread. Wholemeal of course. Enough about the weather. Yesterday afternoon was a bit freaky. It was 3:41pm when I sent a Tweet : "I can feel an earthquake". It was quite obvious, and I am sure it felt stronger than the quake in the morning of December 26th 2004. Within 10 minutes, Twitter was full of earthquake news. Nothing on mainstream news media. Twitter is the place to be when something happens. I saw the first update on the USGS website at 3:49pm. 8.9 Richter off North Sumatra. I guess a lot of people thought the same thing.... Tsunami? Well, we still had work to do in the dive shop, equipment to get ready. We assumed that there would NOT be a tsunami. But by 5pm, I headed home. No tsunami news from Aceh, plus experts on the BBC were saying it was the wrong kind of 'quake. I hoped for the best. Still, the beach areas had been evacuated and many (thousands of) people had headed to high ground. The road over the hill from Kata Beach to Chalong Bay was packed, people had gone up there, like 150m above sea level. Took me about 1 hour to get home 20km, but soon enough it was clear - no tsunami. A bit freaky for many people I am sure. Repeat - there was no tsunami. There are thousands of earthquakes round the world every day, but tsunamis are rare. And now .... tomorrow is Songkran! Thai New Year (Pee Mai), big festival, public holiday for 4 days. Water everywhere. 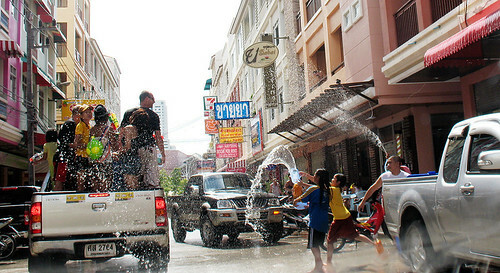 In Phuket, the water throwing lasts just 1 day, tomorrow, 13th April. Having "done" Songkran so many times, I am considering staying home all day tomorrow. Sounds a bit Scrooge-like, too much fun! And yeh, I might head out in the afternoon for some watery madness and some booze. Over the years we've done Songkran different ways. Last year I was in my wife's hometown Chumphon. Very nice day - see Songkran 2011 in Chumphon. If you are here for Songkran, have fun, take care, by all means go mad, but sensibly. Tomorrow, you are guaranteed to get wet, no matter what the weather is doing! But drenchings with buckets of iced water are easier to bear when the sun is shining!